The "Societa de Aviazone Ing Caproni" bureau (better known simply as "Caproni") proved something of a pioneer in the field, resulting in their first impressive attempt sometime in 1913 as the "Caproni 260hp". This version sported a "pusher" engine and a pair of "pusher" engines - these 80-hp Gnome rotary engines all being mounted in-line along a central fuselage nacelle. The three-man crew sat in the forward part of the nacelle, and two slender fuselage booms carried the triple rudder tail unit. The two pusher systems drove propellers mounted at the tail booms via a tractor arrangement. Prior to the first flight, in October 1914, the two forward engines were re-installed with direct propeller drive. In the post-war years, these respective systems came to be designated as the Ca.30 and Ca.31. After a period of evaluation, it was determined that the new larger bomber platforms were wholly underpowered. Caproni set to achieve better performance from his "giant" and moved the puller engines to the tips of each tail boom, keeping the pusher system in its centralized nacelle approach from earlier. This allowed each wing-mounted engine to directly drive its propeller more efficiently. The French-based Gnome rotary engines were then replaced with Italian FIAT A.10 inline types and produced the new company designation of "Caproni 300hp". A contract was signed for 12 Caproni 300HP bombers powered by three 74.5kW Fiat A.10 engines. First flight occurred in late 1914. A further 150 were delivered during the next two years. These aircraft were also known as Ca.1s and were followed by nine Ca.350HP machines (with the third engine replaced by a 112kW Isotta Fraschini) designated Ca.2. 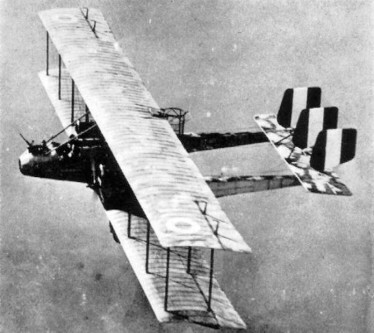 The Ca.1 featured a wide-span, four-bay, biplane wing assembly. At the center of the wings was fitted the crew nacelle containing the four crew and the third engine. The primary engines were fitted ahead of the twin booms extending aft in a "puller" function arrangement. The third engine on the central nacelle operated in a "pusher" format. The crew consisted of two pilots, a forward gunner and a rear gunner - all fielded in tandem positions. The forward gunner sat in the forward-most compartment. Distinctly, the rear gunner stood in an open air, cage-like pulpit behind the upper wing assembly and ahead of the pusher engine at rear. The twin booms extended aft into a tailplane. The tailplane held three vertical tail fins. The undercarriage was a fixed tricycle featuring two single-wheeled main landing gear legs and a single-wheeled nose landing gear, all supported by struts. The rear of the empennage was supported by a tailskid fitted to the extreme end. Construction was mainly wood covered in fabric. Bombs were suspended under the central nacelle and there were 2 x 6.5mm FIAT-Revelli machine guns used for defense. These machine guns were fitted to the front gunner tub and the rear gunners pedestal cage. The 3 x Fiat A.10 6-cylinder, liquid-cooled in-line engines delivered up to 100 horsepower output each. This supplied the massive aircraft with speeds of up to 75 miles per hour as well as a range equal to 344 miles. Her service ceiling was listed at approximately 13,000 feet. Her empty weight ranged in at about 7,200lbs with a gross weight tipping the scales at 8,800lbs. Wingspan was nearly 23 feet with an overall running length of 36 feet plus. She stood 12 feet high. This revised development led to the Italian Army and the first Italian bomber force. The aircraft was designated officially as the Ca.1 by the Italian Army and production increased by the middle of August 1915. A total of 162 were delivered up to December 1916. Their first true sortie in Italian Army service occurred on August 20th, 1915, in an attack on Austrian targets at an airfield in Aisovizza. Most Ca.1s were committed to such attacks, primarily against the Austro-Hungarian Empire and the new bomber eventually served in some fifteen total Italian air squadrons during the war effort. Three of these Italian squadrons were known to have operated out of France with another stationed for action out of Libya. A modified version (for which no post-war designation seems to have been allotted) was the Ca 2, in which the 'pusher' A.10 engine was replaced by a 150-hp Isotta-Fraschini V-4B. Only nine of these were completed. In the post-war years, the Ca.1 was redesignated Ca.32. The Ca.1/Ca.32s that survived were refurbished to be used as passenger airliners. These could transport up to six passengers in relative comfort and fell under the Caproni designation of Ca.56. The Caproni Ca.2 ("Caproni 350hp") was a minor variation (improved engines) on the strengths of the Ca.1 platform. Development ultimately led to the definitive Ca.3 bomber platform.